Ladies and gentlemen, start your engines. The new Mad Max is thrilling and hugely entertaining. Tom Hardy and Charlize Theron. Mad Max: Fury Road is everything we desire in a summer popcorn movie, and more. 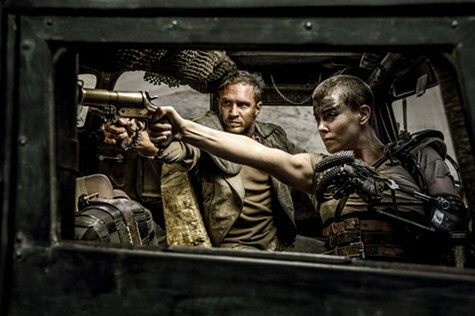 It took thirty years — plus a change of leading men and a few detours involving talking pigs and lovable penguins — for filmmaker George Miller to get back to his saga of the durable Australian ex-highway patrol officer and his cross-country predicaments, but this new Mad Max is worth the wait. Our hero is minding his own business, standing alone in the desert munching on a two-headed lizard, when he’s suddenly swept up into the same basic conflict as in the original Mad Max, Mad Max 2: The Road Warrior, and Mad Max Beyond Thunderdome: big bullies chasing smaller bullies in a wasteland called Wasteland. Some situations have been updated. The most precious thing on earth is now water, not gasoline. Max is no longer played by persona non grata Mel Gibson; he’s been replaced quite nicely by rugged English actor Tom Hardy, who displayed considerable range in such films as The Drop, Locke, and The Dark Knight Rises. 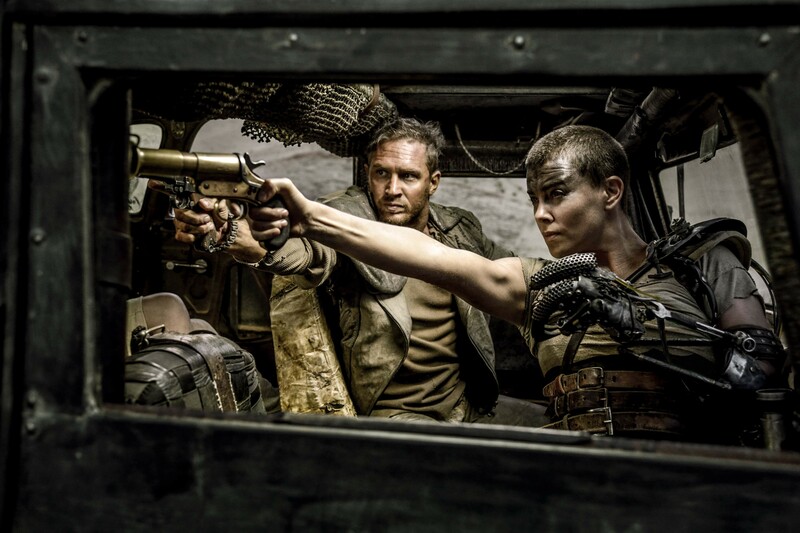 Max’s counterpart is a rebellious woman warrior named Imperator Furiosa (Charlize Theron), who has absconded with the ruling class’s harem, all of them pregnant, and a tank truck full of mother’s milk. There goes the future. That’s why they’re being pursued by the horde of gothic uglies driving outlandish rigs bristling with weapons. The frantic mayhem starts early and, except for one or two brief pit stops, never really lets up. When Road Warrior was first released in 1981, it immediately changed the action-fantasy-film landscape with its intensity. Fury Road successfully rachets up the velocity from there, with two glorious chase sequences showing off some of the finest effects work in the business — Miller swears he soft-pedaled the CGI in favor of live-action stunts. There’s a subplot involving the villainous King Immortan Joe (Hugh Keays-Byrne from the first Mad Max) and his empire of blood-deprived slaves, and one important subtext: Road Warrior’s benign hippies have been supplanted by righteous women rebels seeking to return humanity to The Green Place. All that, however, plays second fiddle to dueling hot rods, rolling Molotovs, and backseat parkour, filmed on location in Namibia and Australia. Miller is truly the master of the extended car chase, a splendidly lethal mechanical ballet with art direction that rivals Terry Gilliam and editing that would impress Russ Meyer. Nothing onscreen in the past year is as viscerally exciting as Fury Road’s chase scenes. They surpass anyone’s gaudiest Burning Man-goes-to-Iraq nightmare scenarios. Theron’s Furiosa, with her claw-like prosthetic arm and post-Hunger Games bitterness, nearly steals the movie from Hardy’s taciturn Max. In the screenplay by Miller, Brendan McCarthy, and Nick Lathouris, Max functions as the strong silent type alongside Furiosa’s band of female revolutionaries, yet he’s destined to remain an outsider, a convenient starting point for putative sequels. The supporting cast, featuring Zoë Kravitz as one of the rebels, and Oz bodybuilder Nathan Jones as the empire’s monolithic bogeyman (aka the Vernon Wells part), suitably fleshes out the secondary combatant roles. Still, as thrilling as Fury Road is, there’s something missing. Everyone’s favorite supporting player in Road Warrior was the Feral Kid, a junior caveman in animal skins who communicated solely with grunts, played by eight-year-old Emil Minty. Mr. Minty evidently hasn’t worked in movies for twenty years, but his presence is sorely missed. That’s really the only flaw in the hugely entertaining Mad Max: Fury Road.